This is my third post for the April A-Z Challenge. 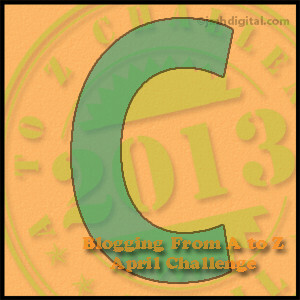 I am blogging every day in April using the letters of the alphabet as prompts. Today I am going to write about Samuel Cleage’s building operation. Samuel Cleage owned the plantation where my Cleage ancestors were held as slaves. When he died, the slaves were divided between his sons. I am writing about the time before this today. Samuel Cleage, who spelled his name “Clegg”, was born in Lanchaster County, PA in 1781. He moved with his parents and siblings to Botetourt County, VA. After his parents died he moved with his family and slaves to McMinn County, TN. As I was getting ready to write this I realized that he didn’t just get on the train and move, that they must have traveled by wagon down well worn, but primitive roads. Not only was he moving his whole little community of married children and slaves, 339 miles through the Blue Ridge Mountains, he also carried the tools of his trade – whatever he needed to build brick houses. As he traveled he would convince farmers along the way that they needed a fine brick home to go with their fine farm. For payment he accepted slaves, gold or livestock. They say that some of these houses are still standing. I can’t imagine how long it took the group to travel this way. A fully loaded Conestoga wagon, the usual method to move through the mountains in the early 1800s, could travel 5 miles a day. That would take about 4 months if you traveled straight through. They didn’t. They were stopping and building brick houses. And they had to make the bricks! How could that work? All sources agree that by the time he reached McMinn County, Samuel Cleage was a very wealthy man, both in slaves and gold. I think I will have to check into this a little further. Here is a description of the way traveling worked. To read more, click the title. First the word, Conestoga, America’s first big truck. It was made in Conestoga, Pennsylvania, and it was one huge wagon: 26 feet long, 11 feet high, with the capability of carrying 8 tons. 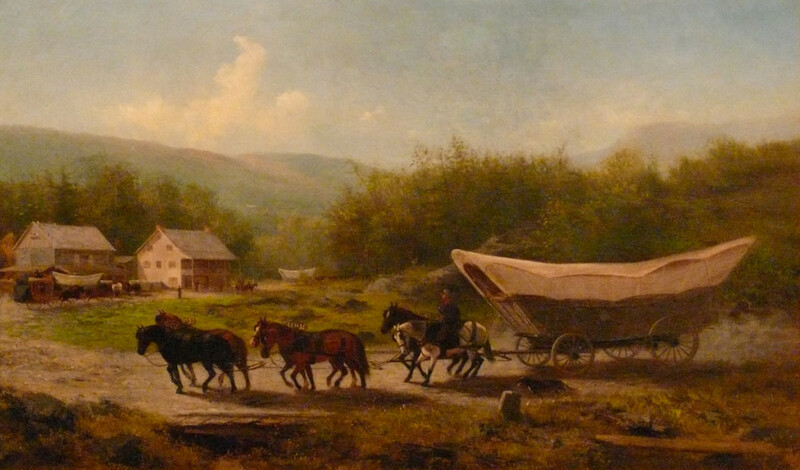 Pulled by five or six horses and followed by as many as a dozen packhorses, the Conestoga wagon became any traveling family’s best friend. 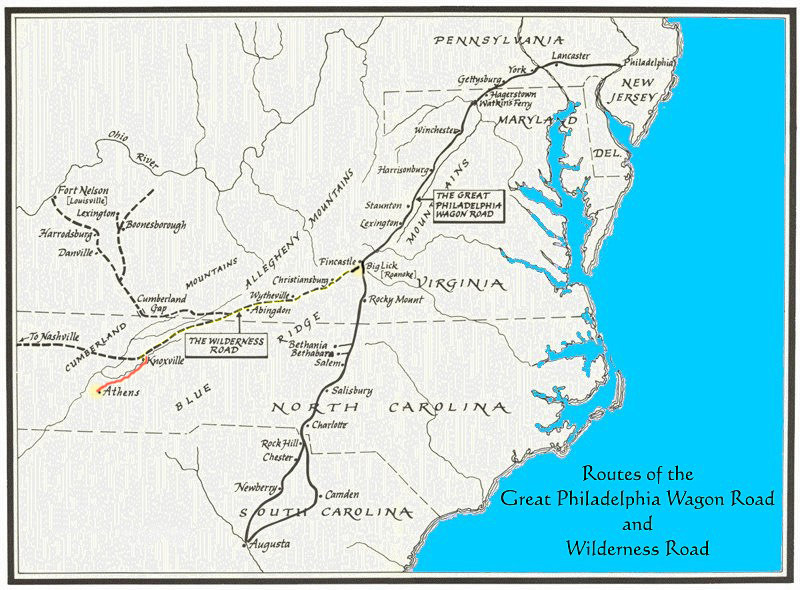 It became the expected sight along the road known by many names: the Warrior’s Path, the Carolina Road, the Valley Pike, the Great Philadelphia Wagon Road, or simply the Great Wagon Road. I outlined the section of the Wilderness Road they would have taken to Knoxville, TN, where the road turns west. At that point they would have continued south to Athens TN in McMinn county. Above I mentioned that they had to make the bricks before they could build the houses. “They” being the highly trained and skilled slaves that were traveling too. It was not easy to make the bricks. And it wasn’t a quick process. Here is how Joe Guy described it in his book “The Hidden History of McMinn County” There is also a link to this chapter in the title. 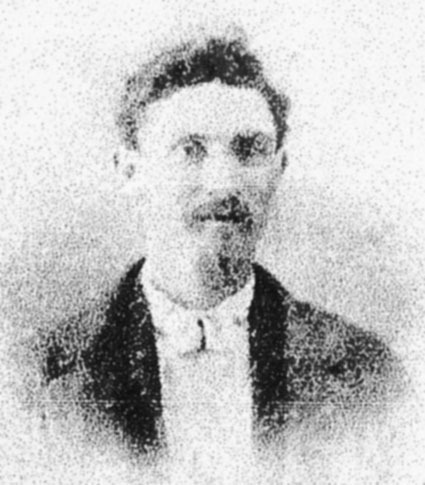 Samuel Cleage, the itinerant contractor who traveled into the Tennessee Valley from Virginia in the 1820’s, is generally credited for the construction of several historic homes and buildings in East Tennessee, especially in McMinn County. While it is true that Cleage was the driving force behind his construction business, it is important to remember who, in fact, was actually performing the labor. Besides livestock and gold, Cleage was often contracted to be paid in slaves after having completed a house or building. Many of Samuel Cleage’s slaves later adopted the Cleage name when they obtaining their freedom, and several black families in East Tennessee still trace their lineage to these Cleage slaves. Cleage was a wealthy landowner besides being a builder, and so he used his slaves almost exclusively as bound workers in his construction business. One of the duties often exclusively regulated to the slaves was brickmaking. By the time Samuel Cleage was involved in building, the art of making brick had been around since 3500 BC. Essentially, 19th century brickmaking involved five steps: winning or digging the clay, preparation, molding, drying, and firing. East Tennessee is well known for having the natural clay useful for brick production. Once dug by the slaves (normally in the fall), the clay was exposed to the weather so that the winter freezes could break the clay down, remove unwanted impurities, and allow it to be worked by hand. In the spring and summer, water was added and the clay was worked by the slaves’ hands and feet in large open pits until it obtained a smooth consistency and most of the rocks and sticks were removed. The clay was then taken to the moulding table, where the slave designated as brickmoulder directed several assistants in the process. A skilled brickmoulder would work at the moulding table for twelve to fourteen hours, producing 3500 to 5000 bricks in a day. A clot of clay was rolled in sand and “dashed” into a sanded mould, which prevented the clay from sticking. Once the clay was pressed into the mould, the excess clay was removed from the top of the mould with a flat stick. Moulds ranged from single to six bricks at a time, but single brick moulds were often desired because even the slave women and children could be employed in carrying the “green” bricks from the table to the drying area. The “green” bricks were then stacked and dried for about two weeks. After arriving in McMinn County, Cleage picked out a spot and built the house below, which is still standing. The black and white photographs were taken during the 1930s. The color photo is more recent. I read an article online that described the renovations the new owners were carrying out to make the house livable again. Unfortunately, I cannot find the article again. Ghost of Cleage House – a ghost story that took place in the Samuel Cleage house. Library of Congress pages with drawings and photographs of the Samuel Cleage house. Article of Agreement Between Samuel Cleage and Overseer – 1834. My great grandfather Frank Cleage is mentioned as one of the slaves. Front door. A more recent picture on the right shows that some work had been done. Front door, outside, drawing and inside. Where did all those papers come from? Just catching up on your AtoZ posts. Maybe so. During the challenge I have been looking at people I haven’t looked at before and don’t know much about. It has been very interesting. You’ve done so much research for all these posts Kristin! And what great discoveries. It’s funny how we slip into modern-day thinking from time to time (like the travel) but then have to remind ourselves that isn’t how it was way back. He must have been a determined man, and done a good job, but every time I hear about his wealth in slaves or taking his family and slaves I cringe. I know it’s how it was, but again in modern terms it doesn’t sit well. I looked in vain for a picture with some black people heading down the Wilderness Road. I’m sure that Samuel Cleage wasn’t the only man traveling with slaves. Did not find a single one. It didn’t sit well with many people then, most of the enslaved people, for instance. And they were back in those days when that’s how it was. Didn’t sit well at all, even with their 1800 sensibilities. It’s not that I think all the slave holders were monsters, but I do not think that they were the only people around then. If we say “that’s how it was” and we can’t judge them through modern eyes, aren’t we disregarding, in this case, the slaves? What a fascinating history–and a haunting one. Each of those bricks, built with slave labor, carries with it a burden of history. I wonder if you did all this research yourself, and what a journey it must have been to be able to go back that far. Also how this knowledge has changed you and the way you see yourself and your history. Thank you. I find sources and sometimes information comes to me through cousins. I’ve been to Athens, TN but I didn’t know there were still houses there. I think I will have to go back and see them myself and touch the bricks. You can still see marks from the making and handling on the bricks. I don’t think it’s changed me to find out my ancestors history but maybe it has. It’s like I had a skeleton of knowledge and what I learn fleshes it out. But so far I haven’t learned anything totally that changes who I always thought I was, although I know people who have. For this history fan, your post held a lot of interest throughout. Wish I could spend time with all those history books, or just read this again and again. Great pictures. They tell the story just as well, and the combination of story and photos makes for a fascinating read. Thank you Silvia. I think pictures are a necessary part of understanding the times, at least for me. Great research! Until I read this post, I hadn’t realized that some of the routes to the West went south from Pennsylvania before heading west. I also never realized that some slave owners were people who were born in the north, but had moved to the south. I think they had to go south first to get the Cumberland Gap through the mountains. I am glad you turned the comments on. I visited last night but couldn’t comment. Your posts are intriguing, interesting and educational. As I have been following your posts for some time, you had me confused at the start! It was very interesting to note how slaves took on the name of their owner (I even hate the thought of slavery and wonder why they would take on the names of those who worked them too hard and most often mistreated them). Have you ever thought about putting your posts into a book? I would buy it/them!